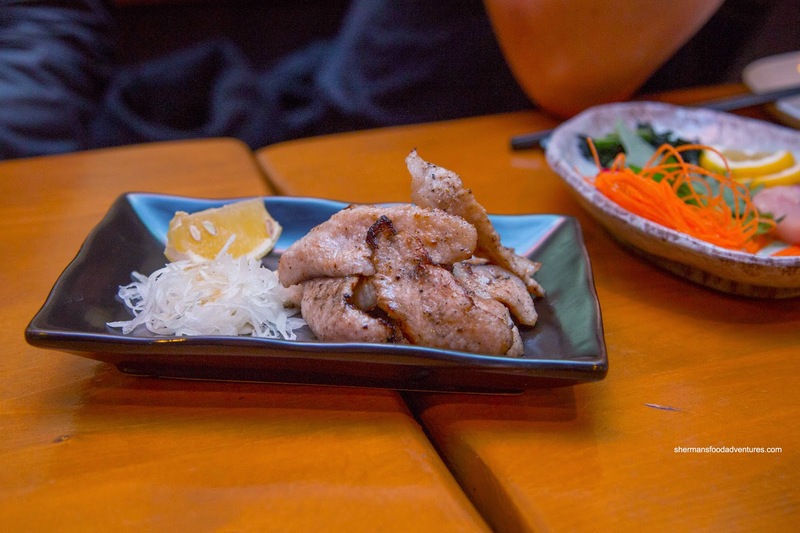 After a long break from heading into Downtown, we went in search of late-nite Japanese eats. 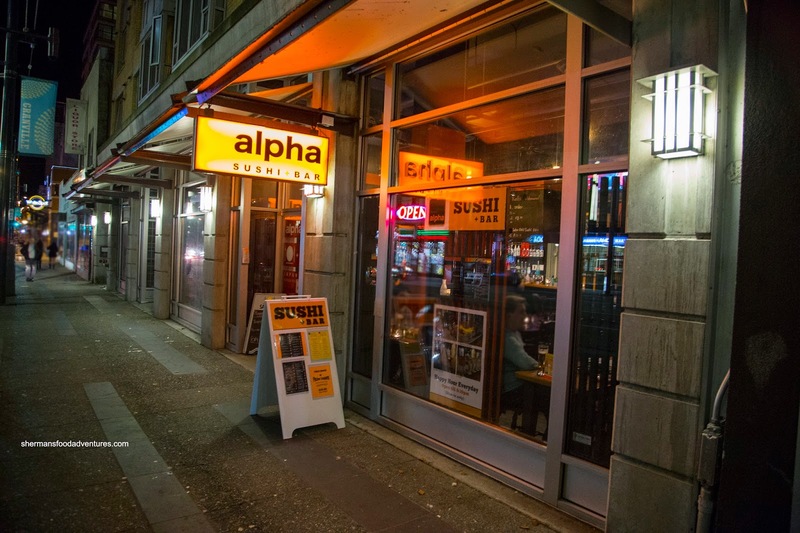 At the Southernmost end of the Granville Street Entertainment District, Alpha Sushi & bar was our next food adventure since they were open past midnight. In fact, when Milhouse and I were walking to the restaurant from our parking spot on Davie, we passed by many other restaurants that were open pretty late. Excellent, more potential future late night food forays! At first, I thought it was a mistake when the Assorted Sashimi arrived. 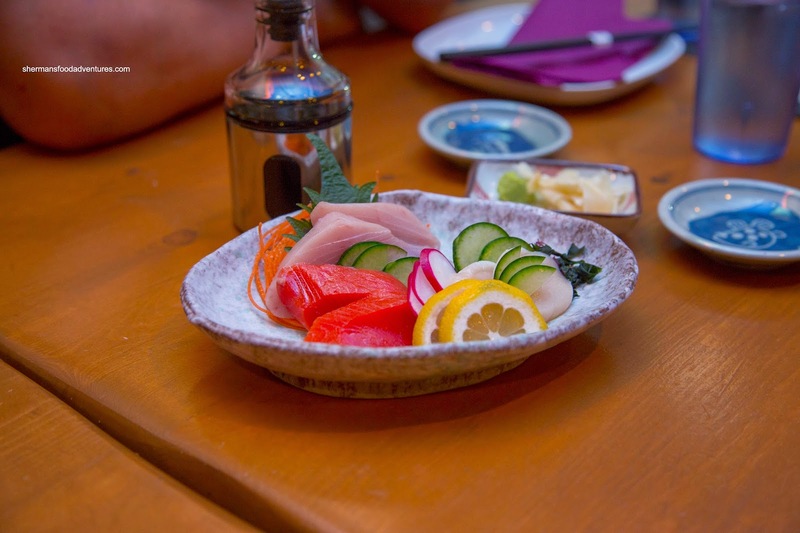 With only 2 pieces each of sockeye salmon, tuna and hotate, it sure didn't seem like a whole lot of substance. However, quality definitely reigned supreme as the tuna was buttery soft while maintaining a chew. The scallop was sweet, buttery and fresh. Completing the trifecta was the equally good salmon which was naturally sweet with a bite. Next up, the Yam and Potato Fries were somewhat disappointing. They were just not fried enough as the exterior wasn't even all that crispy. I guess this may have been intentional, but I much prefer my fried items crunchy, not firm and greasy-wet. 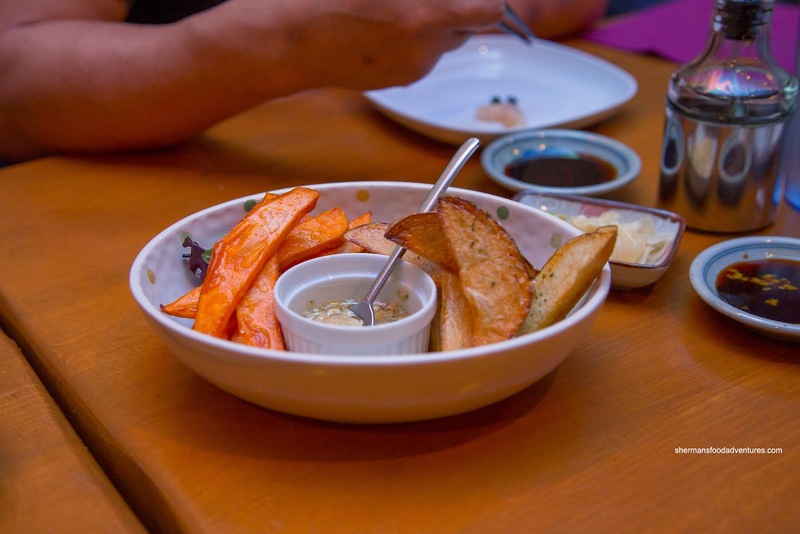 However, the garlic anchovy mayo was fantastic adding a certain Earthy saltiness to the dish. With what was my favourite dish of the meal, we had the Grilled Toro Pork in garlic onion sauce. With a squeeze of lemon, the succulent meat had a little of everything including tart, sweet, savoury and aromatic. The char around the edges of the meat helped add both smokiness and caramelization of the sugars. Hence, there was a depth-of-flavour. Continuing on, we had a somewhat too uniform looking Ebi Mayo. 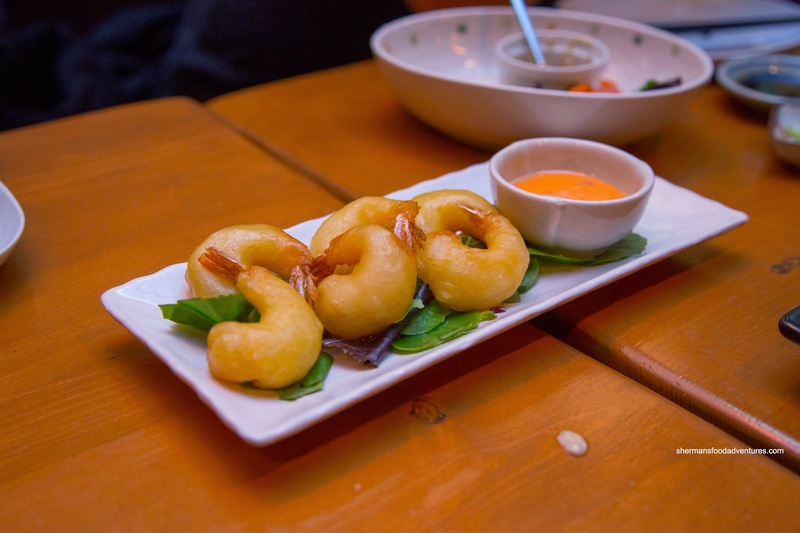 Despite the appearance of Chinese takeout-looking prawns, they were anything but. The exterior was lightly crunchy while the ebi had a buttery snap. The side of chili mayo was purposefully spicy and somewhat sweet. 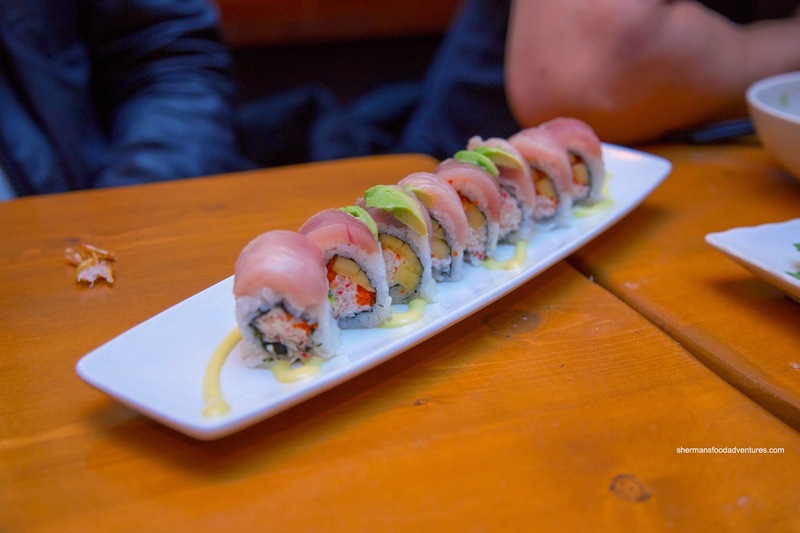 We ended up with 2 rolls beginning with the TD Roll consisting of mango, tobiko, mayo crab meat wrapped in albacore tuna and avocado with plum wine mustard mayo sauce. With the sweet ingredients, the flavour profile was as such. I found the rice to be chewy while sufficiently moist. It was mild tasting, yet the rest of the ingredients definitely had impact. 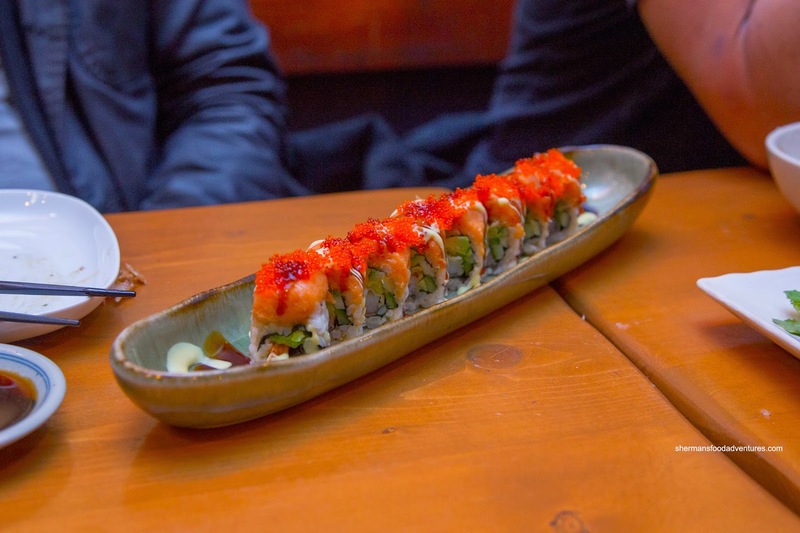 The second roll was the Spicy Tuna Prawn Roll with 2 tempura prawns, avocado, tobiko, cucumber wrapped in chopped spicy tuna with sweet & spicy soy sauce and plum wine mustard mayo sauce. We didn't find this particularly spicy (not even a mild amount), rather it was sweet and saucy. 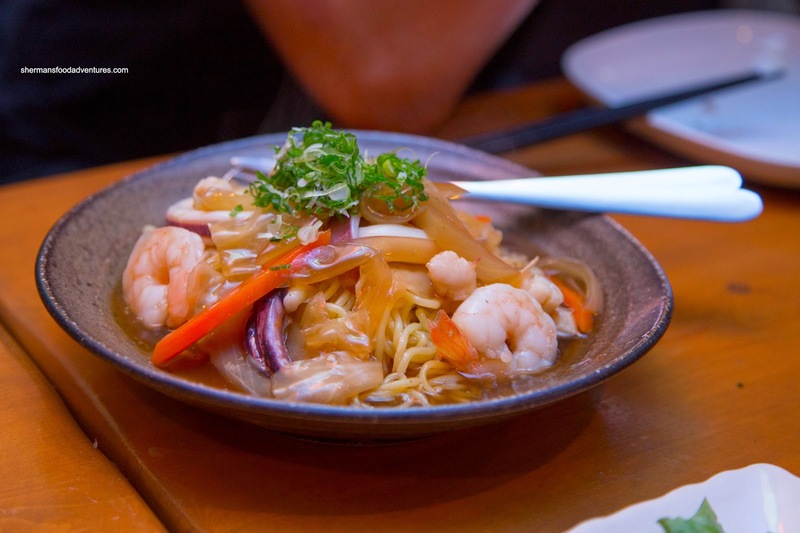 Our last dish was the Ocean Yaki Soba with pan-fried yaki-soba noodle with scallops, squid, prawns and vegetables topped with a rich soy flavoured broth. The ramen-like noodles were toothsome with a slight seafood taste. The seafood (shrimp, squid and scallops) were well prepared where each texture was on point. There was a certain tang and sweetness to the dish. Although not outstanding, the eats at Alpha Sushi were solid and appetizing. Considering all of the other late-night options around, if one wanted Japanese food, Alpha would not be a bad choice at all.